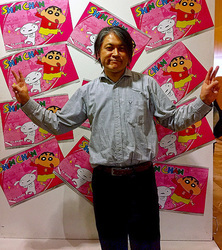 Animation director Yūji Mutō is most famous for directing the world-renowned TV Asahi animated series, Crayon Shinchan. Mutō-san began his professional career directing episodes for TV series such as City Hunter, Tsuruhime Ja!, and Kenyuu Densetsu YAIBA (1993), before moving on to direct the 1993 feature film, Bonobono. In 2004, he became the third director to helm the long-running television anime Crayon Shinchan, not only holding this position longer than any previous director, but also during the period for which the series has become most popular outside of Japan. In addition, he has been the director of such series as Corrector Yui, Haunted Junction, Pia Carrot E Yokoso!! - Sayaka no Koi Monogatari , Ultimate Girls, and many more. He's also done the storyboards for many series including Crayon Shinchan, Green Green, Scrapped Princess, as well as others.